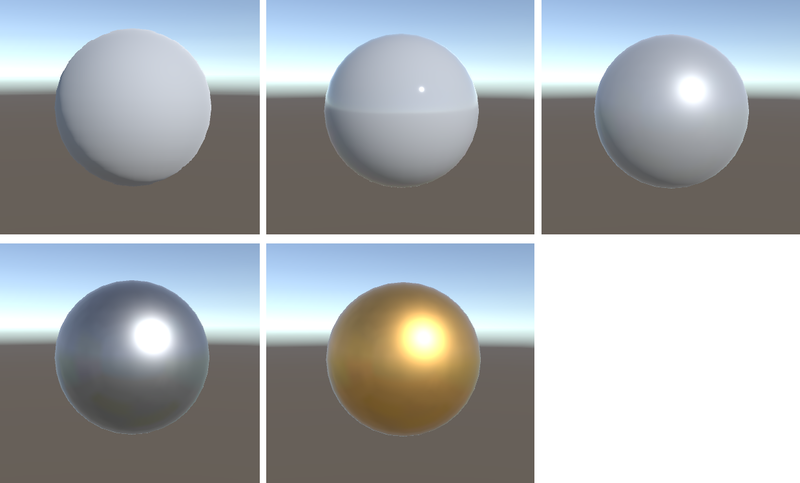 I've been writing some custom shaders based around Unity's Standard BRDF, which is uses GGX distribution term and Smith visibility term. It looks great at either end of the smoothness scale (1 and 2 in the pic below). However, with the smoothness set to about 50%, things start to get a little ugly (3). Increasing the metalness makes it worse (4), and strongly coloured specular gets worse still, as different colour channels blow out at different rates(5). This seems to be caused by specular term returning >1 around the highlights, probably caused by Unity's hack of multiplying specular by pi (instead of dividing diffuse) as shown in the code snippet below. // HACK: theoretically we should divide diffuseTerm by Pi and not multiply specularTerm! HDR rendering helps a lot, but unfortunately our project is on mobile and using LDR. I'm making a car paint shader with a clear coat, so the base coat will likely be semi-rough and semi-metallic in a lot of cases which seems to be a worst-case-scenario for this BRDF. Can anyone suggest a way to get saner specular highlights? Either some kind of rolloff for out-of-range specular values, or a different BRDF altogether? Using physically based BRDFs only makes sense if your entire pipeline is built for physical units - the extreme range of values can't be displayed properly without some form of tone mapping. You didn't include that part of the code but from the looks of it I'd say you're doing a simple clamp() followed by linear->sRGB conversion, which causes the bad highlights. Since you're not ready to run your entire frame in HDR, you could apply something simple like a sigmoid operator to just the specular component. This may look a bit off next to other BRDFs but should make those highlights much more pleasant. Not the answer you're looking for? Browse other questions tagged brdf pbr unity ggx or ask your own question. What is the potential equation in PBR?